Those of you who have become devout readers of both my postings will recall my confessing that I like to tell stories. You’ll also recall me say these stories almost always have a point, but that they sometimes need a little sharpening at the end. Such is the case of last week’s posting. First of all, I’m feeling much better. Thank you for your concern. Pay no attention to the lingering cough. The doctor assures me there’s no cause for worry. He has clearly never tried knitting with size 0 needles while coughing so hard you can hardly find the stitch to enter. But I digress. Last time I talked about the benefits of having a well rounded group of projects on your needles. I even gave you a little ergonomic blessing that there is nearly scientific merit in doing so. I want to talk a bit more about why this is true. Last week when I was sick I had this craving for chicken soup. Go figure. I ate it nearly everyday. But I’m here to tell you that after about the fifth day of it I didn’t care if another chicken ever swims in hot water again. I’m not interested. Now why is that? The quality of the soup hadn’t changed. It’s simply that I wanted, no needed, variety. Let’s continue the food analogy (because I’m eating lunch while I write this) and imagine a fantasy diet of only pizza. I know you’ve dreamed about how you could easily survive on pizza. It’s got all your favorite food groups. The crust group. The cheesy goodness group. A rogue veggie or two may find its way on top. It’s practically the perfect food. But then there are those pesky carbs we hear so much about. And I’m told there’s a high fat content in pizza which isn’t so good for you. So armed with this knowledge most of us abandon the pizza diet after college or when we start to look like one. What’s this got to do with knitting? Here comes the part where I sharpen the point. Like adding variety to your diet, you have the option to expose your body to a variety of knitting postures which require a certain amount of muscle energy. It can be a one-note diet, or a symphony. You only knit with size 1 needles, or you have a bunch of projects on various size needles. Please consider the position your hands and wrists in while you’re working on your knitted projects. Let’s look at some photos to help make the point. 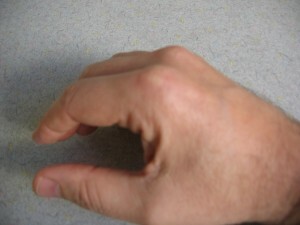 The size of needle is a clue as to how much muscle activity is required to hold them. The smaller the needle, the greater the difference from resting posture and the more muscle activity required to simply grip the needle. 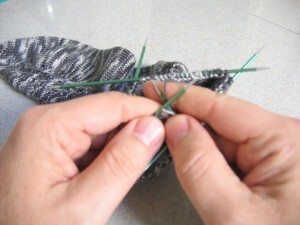 Now look at the picture of my hands working on size 9 US circular needles. (Isn’t this yarn cool? I wish you could touch it. Very soft merino and I love how the knit-one-below pattern adds vertical dimension to the color way of this yarn.) Because the needles are thicker there is less grip distance to traverse from neutral posture to grip position. This allows the muscles to work closer to what we Physical Therapy geeks call “mid-range” which is where muscles have their greatest strength and joints are under least stress. Simply put, it’s easier to grip something that is close to resting posture size that something that is smaller or larger than resting posture. It seems obvious when you’re working in the kitchen to use utensils that are easier to grip. But you can't always do that when you're knitting. The amount of grip strength required to grip needles with diameters smaller than our resting posture grip position may seem minimal, and admittedly, it’s not huge. But how long are you going to knit? How often do you use tools this size? And how challenging is the work for you. These three factors: frequency and duration of exposure (to a posture), and the intensity of the activity you're doing influence the amount of ergonomic risk you are exposed to. There are certainly factors aside from needle size which affect the amount of overall work your hands are required to do while knitting. Project weight, yarn/needle pairing, fiber type, and yarn dimension are others to name a few. I’ll certainly discuss those in future postings. But for now consider the variety of grip (or lack thereof) you expose your hands to while knitting. And ask yourself if you’re knitting posture is like the pizza only diet. If it is then your muscles and joints are crying for variety! If this is your knitting diet then let’s do something about that because I want you to knit forever! No, you don’t have to stop knitting your favorite things on your favorite small needles! You just need to provide your muscles and joints with a variety of movement and position. In short, you need to stretch. Stretching should always feel friendly. This is not a “go for the burn; no pain no gain” activity. It’s gentle, often passive movement. Simply opening and closing your hands and fingers will do the trick. But practice this magic every 15 to 20 minutes while you're knitting. Increase the frequency if you're using small needles or if you're prone to stiff joints in the hands, fingers, and thumbs. Variety is the spice of life. Even your joints and muscles like it. Be a spicy knitter and knit safely! Seemingly as if by magic, a single strand can be knitted into something beautiful and unique to warm and nurture a body. Ergo, I knit.